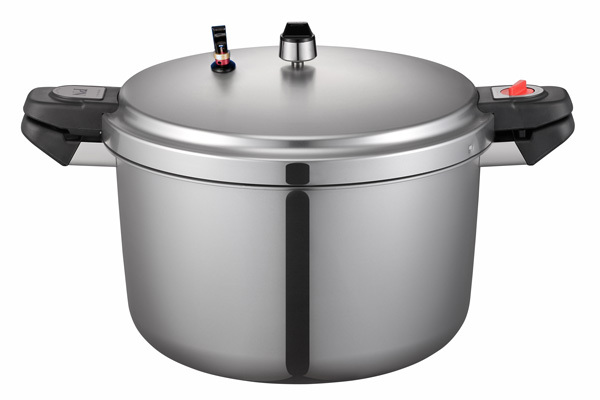 The commercial grade, general use Mighty Mikey pressure cookers are excellent additions to anyone’s menu and bottom line! Equipped with essential safety features, the Mighty Mikey commercial pressure cooker is an excellent tool to create bold and new dishes or to enhance old menu items. The Mighty Mikey helps to bring the overlooked art of pressure cooking back to the commercial kitchen. 1) Color Coded to indicate pressure inside the cooker. 2) Automatically releases pressure when dangerous levels of pressure are reached. 3) Helps release steam faster. Dimensions (inches) 22" x 16" x 13.5" 20.5" x 14.5" x 12"